Last year when I went to Houston I found a lot of great things for my kitchen at Hobby Lobby that were 60-80% off that kinda went with a French Country theme and I had posted all the decor I had put up in the It's Been Awhile...Let's Catch Up post. 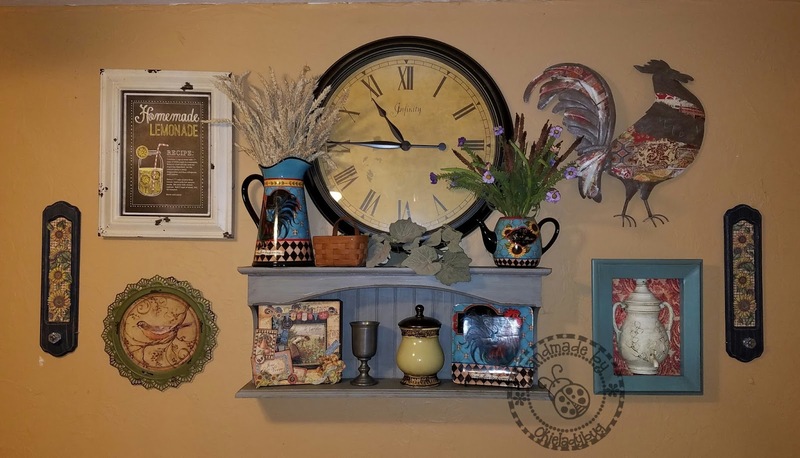 Some of the things I bought were these little wall hangings, not sure what they are called, and I loved the blue on them but I didn't like the background and knew I wanted to change it with some Graphic 45 French Country paper. 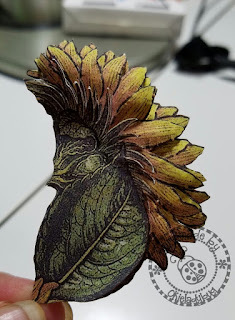 If you read my post a few days ago you know the reason it has taken me so long to alter these *okie stops and says a little prayer that she doesn't go to hell or get banned from Graphic 45 products for her sin*. I am sure the background on these would be wonderful for someone but just not me...it's not my style. 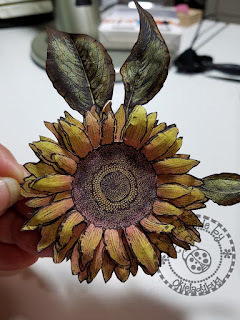 Once I finished the French Country Shadow box project and was printing paper well I knew that I wanted Sunflowers on these some how. I had to fussy cut a lot of sunflowers in order to get what I wanted but it really wasn't so bad since it was something I could do while watching TV in the craftroom. I was able to use my McGill Paper Blossom Roller/Piercer Tool Kit and Mcgill Paper Blossom Ball Tool Kit to help shape the flowers once I got them all cut out *okie wonders why McGill doesn't just sell both sets together in one convenient set but since okie isn't a marketing person she just shrugs and keeps writing her post*. In order to get the look I wanted I had to leave all the petals on the first layer, cut off what looked like the top petals on the middle layer and then cut off all but what where the top petals for the top layer. It might make more sense if you click on the picture and see it larger. 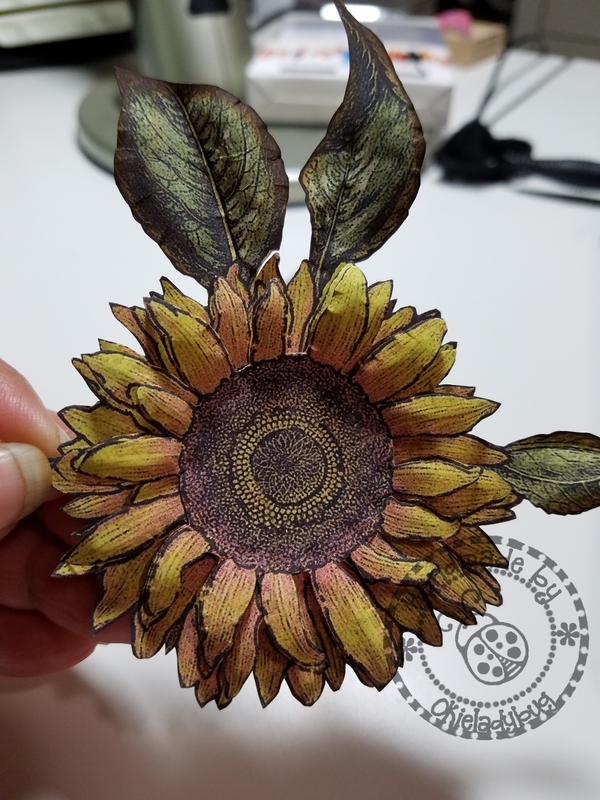 This was another flower on some of the paper and I liked how it was a side view of a sunflower and would add a little more interest on the wall hanging. I cut layers as explained for the flower above. I also cut some flowers and left them with only a single layer to fill in between the layered sunflowers. For the background of the wall hangings I chose to use the red gingham paper as it looked the best with the sunflowers. It was patterned enough to set off the flowers but not so patterned that the sunflowers got lost on them. I also used the same wire ribbon as I did in the bottom of the shadow box. I had to stretch it out a little to make it a little wider so it fit in the area I was doing. Now it probably wouldn't haven't taken me so long to finish the wall hangings but since I had 3 to do there was a lot of fussy cuttin' goin' on up in here! One of the wall hangings is next to the shadow and they complement each other well. 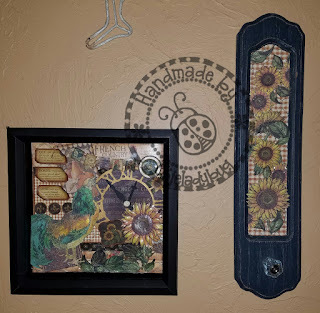 The other two hangings are on my large arrangement wall and look so much better with the sunflowers in them rather than the mosaic patterned paper that was there originally. If you look at the bottom left hand area of the shelf you can see the match box project that I did in that class I talked about a few posts ago. I am still deciding if I want to leave the picture in the big white frame or do something different with some French Country paper and who knows how long it will take me to change it since I seem to be a slow worker these days. Pretty! I love the kitchen arrangement! I agree - I like these much better after your altered them! Shirley, I love your blog!! thank you for sharing!! Wow! You've done an amazing job! Thank you for sharing. I am speechless. Your talent is awe inspiring. You are very talented love your blog thank you for sharing. You did a fantastic job with these! What a beautiful project!! Lots of time spent on this one! TFS!